Phase folded curve of the planetary signal detected in GJ 625 using the parameters of the MCMC model. Left panel shows the CCF measurements, right panel the TERRA measurements. Grey dots show the measurements after subtracting the detected activity induced signals. Red dots are the same points binned in phase with a bin size of 0.1. The error bar of a given bin is estimated using the weighted standard deviation of binned measurements divided by the square root of the number of measurements included in this bin. Blue line shows the best fit to the data using a Keplerian model. Credit: Mascareño et al., 2017. (Phys.org)—European astronomers report the detection of a new extrasolar world several times more massive than Earth. The newly found exoplanet, classified as a so-called "super-Earth," is circling a nearby star designated GJ 625. The researchers detailed their finding in a paper published May 18 on arXiv.org. "Super-Earths" are planets more massive than Earth but not exceeding the mass of Neptune. Although the term "super-Earth" refers only to the mass of the planet, it is also used by astronomers to describe planets bigger than Earth but smaller than the so-called "mini-Neptunes" (with a radius between two to four Earth-radii). Located only 21 light years away, GJ 625 is an M-dwarf star (spectral type M2) about 1/3 the size and mass of the sun. Such stars offer great potential in the search for alien Earth-like worlds, as low-mass rocky planets appear to be more frequent around M-dwarfs. However, finding an Earth-like planet orbiting low-mass stars is difficult due to their stellar activity. This is because signals induced by the rotation of a star can easily mimic those of planetary origin. Therefore, the signals coming from M-dwarfs tend to be comparable to those of rocky planets close to the habitable zone of their stars. Recently, a team of astronomers led by Alejandro Suarez Mascareño of the Canary Islands Institute of Astrophysics, has completed challenging studies of GJ 625, which began in 2013 and lasted over three and a half years. The observations were conducted with the High Accuracy Radial velocity Planet Searcher for the Northern hemisphere (HARPS-N) spectrograph installed at the Telescopio Nazionale Galileo at the Roque de los Muchachos Observatory on the island of La Palma, Canary Islands, Spain. 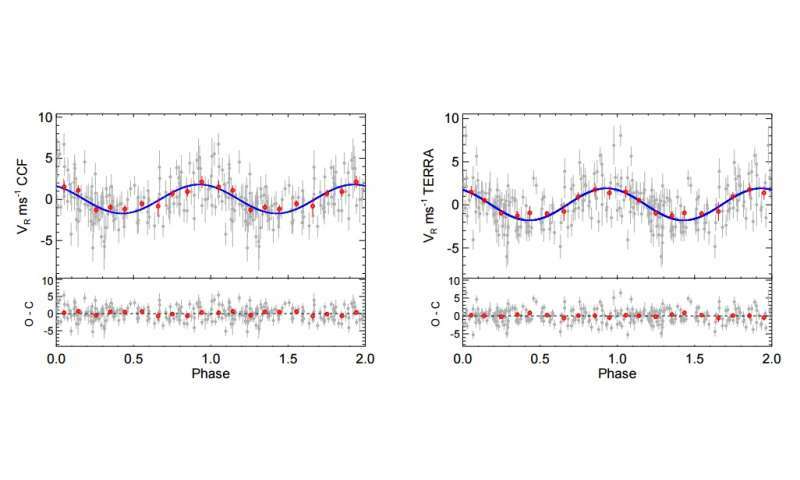 The researchers analyzed 151 radial-velocity time series from HARPS-N as part of the HArps-n red Dwarf Exoplanet Survey (HADES) radial velocity program, which resulted in the discovery of a new planet. 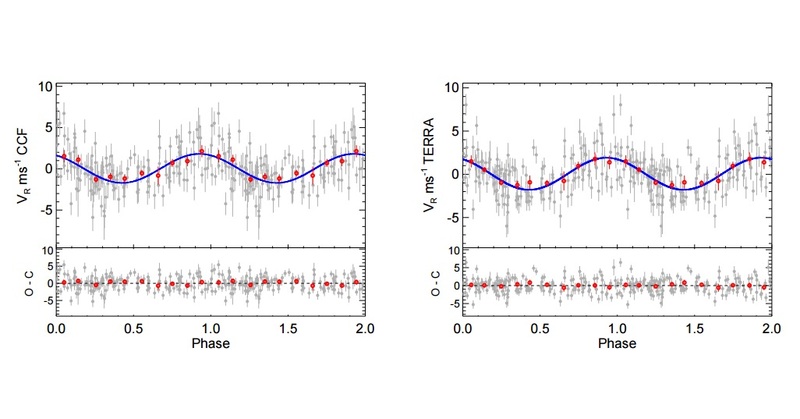 "We report the discovery of a super-Earth orbiting at the inner edge of the habitable zone of the star GJ 625 based on the analysis of the radial-velocity (RV) time series from the HARPS-N spectrograph, consisting in 151 HARPS-N measurements taken over 3.5 yr," the paper reads. The newly found alien world, designated GJ 625 b, has a minimum mass of 2.8 Earth masses, which makes it the lightest exoplanet found around an M2 star to date. The planet orbits its host every 14.6 days at a distance of approximately 0.08 AU from the star, which is relatively close. By comparison, Mercury orbits the sun at a mean distance of 0.38 AU. The results of radial velocity measurements allowed the team to conclude that GJ 625 b is a small "super-Earth" on the inner edge of the habitable zone and has a mean surface temperature of 350 K that is very dependent on the atmospheric parameters. Moreover, the researchers assume that the newly detected exoworld might potentially host liquid water, but more observations focused on GJ 625 b's atmosphere are required to confirm this assumption.